It is compelling from the first moment to the last. Thank you for sharing it with me. What a remarkable father! What a hugely powerful model for his son. And what a great distance his son traveled---from a world of enormous hardship and pain to a life of learning and contributing. You have written about a chapter in our history that is scarcely known and therefore makes a great contribution to the full story of our people. The book deserves a wider audience. Your writing is vivid, immediate, and powerful. This is a review by Sarah Shapiro, author most recently of "Wish I Were Here," and editor of "All of Our Lives: An Anthology of Contemporary Jewish Writing"
"Amanuensis" is a wonderfully entertaining, touching, funny story of a young man's calamitous pilgrimage through the wild, wild world in earnest search of...he knows not what. At once utterly raw and artfully crafted, Jack Cohen's writing voice rings true. 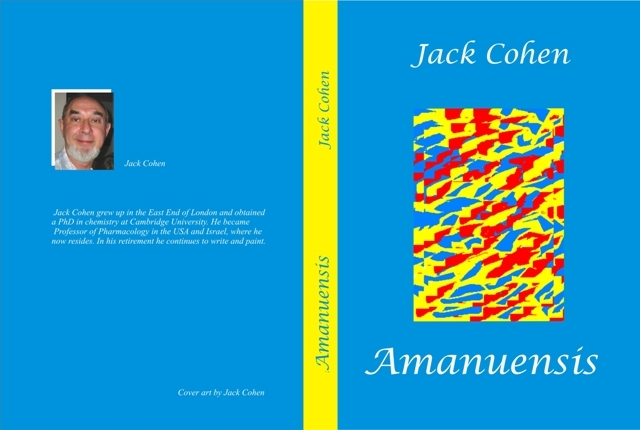 Here are the remarks I made on the presentation of my book "Amanuensis" at the AACI Netanya on Nov 22, 2009. It is said that everyone has a story to tell, but, relatively few of these stories make it into print. The question is why have I managed to get mine to this stage? Many years ago, in the early 1970s, when we had our first house in Maryland, I started to write short stories, and then I took several writing courses. You could say that I had “literary pretensions.” I realized over a period of time that some of these stories were focusing on a specific subject, namely my experiences and a personal family secret that even then I could not articulate. It was not until the early 1980s that I realized that these stories were cohering into a novel. Excerpt 1. Here is the brief excerpt I will read from my book, to set the scene, the beginning: “One of my earliest memories……. It is also said that a writer needs a “myth,” well early on I realized that I had a myth, this story that needed to be told. Although there are people who had much more terrible experiences in their life than mine, for example in the Holocaust, nevertheless I needed to tell my story, to get it out of me. Ostensibly the story is autobiographical, about a Jewish boy from the East End of London, a deprived poor area, who manages to go to Cambridge University, the pinnacle of academic success. This involved a culture shock that would be worth writing about in itself. It would be like a farm boy from Kansas going to Harvard or a poor boy from Ma’alot going to Hebrew University. But, that is not the real plot. The real plot is a secret family tragedy that the boy himself only guesses at, from clues dropped inadvertently by his parents. Who was Julian? Did he really exist? But, we never spoke about it. That is the story behind the story, the motivation for writing this work, that is the myth that lies within. Around this time, in the beginning, I approached Myra Sklarew, a Jewish American poet at American University in Washington DC, who I decided might be an appropriate reviewer of my draft. She took the trouble to read and comment on it, and she gave me two pieces of advice, first re-write the whole thing in the first person. Although it was meant to be a novel, it was clearly auto-biographical and hence I had used the third person tense to distance myself from the story, to try to be detached. She said that it would have much more authenticity if I wrote it in the first person. She also urged me to continue to work on it. So I continued, in my spare time, while working as a scientist, to re-write and expand this novel. Why I persevered is a mystery, but I think it can only be due to the hold the subject had on me. In writing this work, I had decided that it could not be written in a simple descriptive manner, “direct declaratory sentences,” not like the scientific works that I was used to. It had to contrast sharply with that. In this I was greatly influenced by James Joyce’s “Ulysses,” which I had read several years before when I was a student in Cambridge. I think this is the greatest novel ever written, and I could not help but try to emulate it in a way. I would like to read for you two fragments from “Ulysses”…. Joyce’s use of adjectives was quite novel: “The snot green sea, the scrotum tightening sea..” remember this was published in 1922! When Bloom and Daedalus step out into the night: “The heaven tree of stars hung with humid nightblue fruit.” After that nothing could be written in plain text. But more than that Joyce wrote different parts of his books, “Portrait of the Artist..” and “Ulysses”, with different styles, matching the style of writing to the context. Note that Stephen Daedalus, the hero or anti-hero of “Ulysses” is clearly meant to be Joyce himself, yet the figure of Leopold Bloom, his ersatz semi-Jewish father, is completely invented, there is evidence that during his life in Dublin, Joyce never met a Jew. So here you have the mixing of fact and fiction in an autobiographical novel. So I created this book, that I have entitled “Amanuensis.” In looking for a title I wanted one word that could encapsulate the theme, the real theme. What does amanuensis mean? It comes from the Latin word “manu-script”, meaning “written by hand.” The derivative, amanuensis means the one who writes the manuscript, the scribe, usually in early history by dictation. So it was as if I wrote the book from dictation, as if it flowed from my mind because someone was telling me what to write, in a way it was inspired. I call “Amanuensis” an autobiographical novel. Some have questioned my decision to combine true events with either invented or added events that did not happen to me. After Joyce’s “Ulysses” and Truman Capote’s “In cold blood” in 1966, called the first non-fiction novel, I felt that I should be free to make minor alterations to my story to enhance the story line. But, let me state categorically that all the anti-Semitic events described in this book are true and actually happened. This includes the incident with the boys and the comics, the nurse in the hospital, my father being beaten up on VJ Day, and the man on the bus. Other people who grew up in similar circumstances have questioned this focus on anti-Semitism because they did not experience such a litany of incidents in Britain. But, I did and I wanted that to be recorded. Now the family mystery was solved many years later when I discovered that Julian had in fact been my older brother who had died at birth in 1936 when the doctor failed to give my mother a Caesarean operation, and she was in labor for 5 days, when she almost died and the baby was delivered with forceps. When my father met the doctor she made an anti-Semitic remark to him. But, I will not read this crucial scene, I’d rather leave it for you to read yourself. Excerpt 4. after Julian’s still birth, p. 297 - “My mother had to remain in the …. Since I was unsuccessful in several attempts over the years to get an agent or a publisher to be interested in my work, finally I decided now, with the use of computers to have it self-published. This turned out be much cheaper and easier than I expected, so I went ahead and had it printed. Finally, I want to cover one crucial topic, was my imagined memory of Julian real, was he actually still born. On a visit to London (I used to visit about twice a year) in the 1990s I happened to be passing St. Catharine’s House near the Strand. On an impulse I went in, and found the ledgers containing my own birth certificate in 1938. I then searched for an entry of my parents in 1936, but there was none. I went to the information desk and enquired about still births and they sent me to an office and then I told them what I wanted and someone went away and brought back another ledger dated 1936, and we searched in it and found, lo and behold, the details of a still birth to my parents (see below). So Julian was not a figment of my imagination, but he had never actually lived. My book was a way to commemorate him, a way to give him back his voice and his life. I grew up in the East End of London and experienced many incidents of anti-Semitism. Then I went to Cambridge University and did a PhD in chemistry, graduating in 1964. In 1963 I organized a trip thru Europe from London to Israel and back with a group of strange people in a mini-bus. Then, in 1964 my wife and I moved to Israel for 2 years. We had many interesting , unusual and exciting experiences during that time. During the 1970s I started to write short stories about my experiences both about the East End, Cambridge and living in Israel. Then I took some writing courses which became experiences in themselves. Over time, it became clear to me that this writing was therapeutic in nature, and some of the stories I produced related to my personal life and they gradually cohered into a novel. I would like to mention that there is a disease or rather a condition called Hypergraphia, in which an individual is compelled to write continuously. One person who supposedly had this condition was Vincent Van Gogh who wrote letters every day, sometimes 2 or 3, to his brother Theo. I don’t say that I have this condition, only that I felt compelled to write. The plot of the novel was autobiographical, ostensibly about a Jewish boy growing up in the East End of London, experiencing powerful incidents of anti-Semitism, then going to Cambridge University, which many of you will realize was a great cultural trauma. But, while this is the overt plot, the underlying story is a tragic personal family secret that I needed to come to terms with. This involved the death in birth of an elder brother, still-born two years before me, under particularly difficult circumstances. My mother was left in labor for 5 days, and when my father challenged the young Irish woman doctor she made an anti-Semitic comment to him. This is described in the book, although the actual event is imaginary. When I had finally put this novel together and searched for a suitable name I came up with the title “Amanuensis.” An amanuensis is a scribe. Now I’d like to play a piece of music (can anyone identify it?) it is “Song before sunrise” by Frederick Delius, a famous English composer. What then is the connection between this piece of music and my autobiographical novel? Some years ago I happened to see a movie entitled “Song of summer” by Ken Russell, the well-known and often controversial movie director, well-known for such films as “The Devils” and “Altered States,” as well as a series of movies about composers. But, I was particularly struck by this movie “Song of summer” about Frederick Delius (made in 1968). The story is quite amazing. Frederick Delius was born in Britain of German parents, but went to Florida in his teens and ran an Orange Plantation. He took music lessons and showed great promise as a composer. A young graduate student at Birmingham Music school who had heard and been impressed by Delius’s early works decided to write his Thesis on him, but was unable to locate him, it seemed Delius had vanished. The student, Eric Fenby, eventually found Delius living in a small French village, but he was paralyzed by syphilis. He was unable to use his hands or legs and could hardly speak and was going blind. He sat for days on end staring out at the lovely garden ministered to by his wife and a German servant. The two men worked out a means of communication and Delius told Fenby that although he was unable to write he had composed many works in his head. So Fenby agreed to help Delius write his music down, he became his amanuensis. But, he not only wrote the works down, but he took them back to England and corrected them and had them printed, and then returned for 5 summers to France to finalize each piece of music. Then he set about having the music performed and he became not only the chief expert on Delius’s music but also a well-known conductor. In the sixth year Delius was dying and Fenby asked him what his last wish would be, and Delius said he would like to see the sunrise from the top of a mountain. So Fenby took him in a wheelchair on a boat to Norway and then carried him on his back to the top of a mountain to see the sunrise. This is what a true amanuensis is is, not just a mere passive scribe. I felt symbolically as if I had been carrying the burden of my dead brother for a long time, and writing this story allowed me to finally ease the burden. 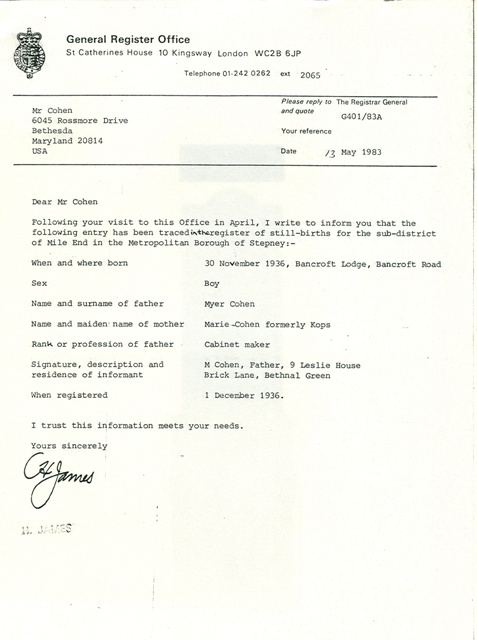 Here is the letter from the Registrar of Births UK confirming the still-birth of a baby boy on Dec 1, 1936 to my parents.